Gymnast Katelyn Ohashi, pictured Jan. 4, had a 9.95 score in floor exercise for UCLA in Monday’s home victory over Arizona State. Ohashi, who grew up in Newcastle, competed for the first time since her Jan. 12 floor exercise resulted in a perfect score of 10 and a video that has been viewed about 42 million times. 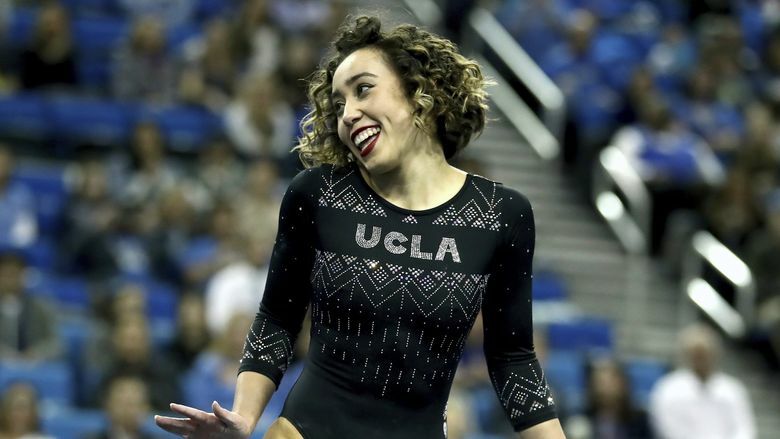 UCLA gymnast — and internet sensation — Katelyn Ohashi competed Monday for the first time since her Jan. 12 floor exercise resulted in a perfect score of 10 and a video that has been viewed about 42 million times. Ohashi, who grew up in Newcastle, got a floor-exercise score of 9.95 points in a 197.775-196.125 victory over Arizona State before a crowd of 10,270 at Pauley Pavilion on the UCLA campus. Ohashi began her involvement in the sport at Gymnastics East in Bellevue when she was 3. She went to high school in Plano, Texas. UCLA is scheduled to compete against Washington on Feb. 10 in Seattle.